Happy anniversary Jan. Thank you for sharing your story. I hope all your dreams come true. That dress is gorgeous. You look so pretty in it. Love the golden shoes. Perfect match. I like your blog and your style and am looking forward to your second year. Here's to you and your lovely blog Jan.
Congratulations! Aren't the people we meet the best part of blogging? Fabulous dress, you look ready for a glamorous adventure! You look stunning! Congrats on your first blogiversary! I love reading your blog and it's been great getting to know you even if it's via the cyberworld. Happy Blogiversary Jan!! I've really enjoyed reading your blog and getting to know you. You look stunning in your dress and lovely heels! What a lovely fabric and a great fit! The cut suits you so well. Happy anniversary! Two great minds are working together, just as I am reading your post, I received your comment. I had no idea your blog was only a year old, you seem to know so many bloggers and its so professionally done so I'm giving you a standing ovation. Believe me when I tell you, my life has been greatly enriched due to your weekly posts and words of encouragement and friendship. I, too, had absolutely no idea I would meet the kind of people, like yourself, when I first pushed that first publish button. Now, lets get down to this weeks post, you look ready to celebrate! Where or where did you find that amazingly perfect dress? Wish I good be there personally to help celebrate this occasion. Although, I am bound and determined to pop in some day. (hubby will be in Bentonville again Wednesday) but this time I'm in Omaha celebrating the birth of sweet Molly. Oh, yes, being a grandma is the BEST. Woot Woot! It's a party time...and you are looking gorgeous Jan! A little bit of vintage glam perhaps...I don't know, there's something ever so little retro about your beautiful dress. Thank you ever so much for being You, for spilling out the greatest posts, and for paying us all the sweetest compliments. We love you Jan! Happy Blogiversary! You are sparkly and gorgeous as you celebrate your anniversary!! Congrats!! I remember when you exploded on the blogo-scene, with enormous energy and great personality. You have sustained all that and more. Your elegant outfit choices and thoughtful musings have made for wonderful posts. I also thought of thanking all the amazing people who have expanded my world through their blogs, but, like you, I knew I'd leave someone out. I think we all share that sense of gratitude for each other, though. Jan you are a gift. So beautifully said and you are looking drop dead gorgeous in this outstanding dress. I love it, the colors and the full skirt are so pretty. I enjoy reading your blog every week because your writing has such a lovely flair. I feel like I'm in the room talking to you. Congratulations on your anniversary! 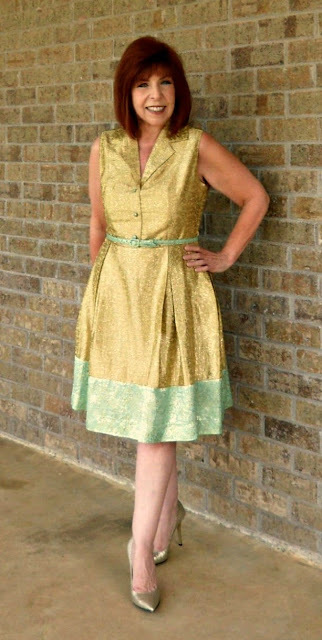 Jan, that is such a wonderful, heartfelt, thoughtful post, and such a gorgeous dress! Adding in your new haircut and the shoes, you are such a star. It is great the way the blog world lets us make friends all over the world, even though we're in different time zones and seasons. Happy Blogiversary to you! "Thank you for including me in your worlds. It's just what I've always wanted." Awwwww. How sweet. We're all so glad to have met you too, Jan. Wow!! You look absolutely gorgeous from head to toe! Details about this magnficient dress, please? Happy Blogiversary Jan! And what a gorgeous outfit to celebrate! You look so pretty in that lovely dress and the shiny shoes! I love your blog and your style. You're a great writer and a a very stylish lady and I'm always interested to hear your take on style, fashion and dress. If that travel bug ever bites hard enough to get you across the pond you have a friend in London waiting for you! Holy jamoly - do people still say that? You look stunning here. And well you should on the occasion of your one-year blogiversary. Thanks so much for sharing your world and your style! You are awesome. Happy first anniversary, Jan! I love visitng your blog, you are bright and beautiful and thoughtful and funny and kind, all the qualities I appreciate in a friend. So keep doing what you're doing, please! And the comments you leave for me and others are always excellent, personal and insightful and generous. Top blogging, Jan! Your dress is really gorgeous, love the shiny gold/mint combination. And a different shape for you, one which suits you very well. Happy Blogiversary, I reached that milestone this week as well! You look amazing in this dress! Congratulations on your First Blogiversary Jan! I concur with your assessment of the joys and life enhancing gifts of blogging. Your writing, style and 'take' on the world add richly to the corner of life that I live. Thank you for all that you bring to this vibrant community. And your dress and shoes - absolutely stunning! Oh my! Aren't you sparkly and fancy!? Gorgeous! I loved how you pointed out all the very cool bits about blogging, the personal connections. You always have an interesting perspective and a humorous take on things. Congratulations on your Blogiversary! I, too, am grateful for the ever-gracious Patti and Visible Monday. Not only do I get to stay Visible, but I get to connect with talented, beautful women. Like you! Happy one year anniversary, dearest Jan. Life is gold with you in it. here to many more years together. Wishing you a very happy blog anniversary Jan! You look wonderfully glamorous and ready to celebrate in that gorgeous gold dress, the perfect anniversary outfit! Here's to the next blogging year for you. oh congrats on one year!! It's definitely a big moment. Remember mine as well and it has been an awesome time. Love your dress. You look absolutely stunning in it and I adore your new hairstyle with it!! One of my favourite looks on you! HappyBlogiversary!! Whoa--that dress is just STUNNING!!! I'm happy to have found your blog--blogging surely makes the world a smaller place doesn't it? Awwww. Jane, you've been one of the best events of this year for me. (Never been called an event, have you?) You are a most talented lady, a force of nature all on your own, and your work on your blog is some of the very best. And you're a beauty. A genuine beauty. Can't thank you enough for your kind words. I don't get to your blog as often as I like as my schedule is upside down right now, but I read more than I'm able to comment on. Thank you for your insights and images and sharing your dear self with me. So kind, Lenya. So glad to have met you this year! I appreciate your sweet remarks a lot ... I saved this Duro Olowu dress for this post. I don't wear it often, but I love it when I do. Looking forward to seeing what you do this fall! As I said, much of what has worked well for me is because of your hostessing. Your kind words mean a lot to me, and I hope I can continue to find things to talk about! Thank you for everything, Patti. Aren't they just! Thank you so much for all. I've been saving this dress, it's part of the Duro Olowu collaboration, and needed a few alterations. I'll take the glamour if I can get it, but don't need adventure just now ! Drop by anytime at all ... 'preciate 'ya! Awwww ... thank you, Renae! Nice of you. You are welcome here anytime! So nice of you, Debbie. Thank you for your kind words. Looking forward to what you're up to this year as well! Thanks Alice! The nice feelings are mutual ... you have such interesting taste, and remix things like nobody's business. Glad you like my dress ... it's Duro Olowu from the early spring collaboration he did. Been saving it, and it's a favorite. You know you are always welcome here! Thank you, Aya ... I love this style of dress, but it took considerable alteration to make it work for me. It's such pretty fabric that I couldn't resist it. Nice of you, kid. Glad I found your blog ... it's become a favorite. Stop by anytime at all. Thank you so much, our Alicia! All those nice things about my blog go right back to you, double. You're always a first stop, although I miss a post or two sometimes! The next year? From your mouth to the ears of any gods who claim me! You know you are welcome here always! Happy first blog anniversary, dear Jan! And what a beautiful dress to celebrate it! I love your writing style and always like to see what you're wearing and to read your comments about the outfit. Thank you, lovely Sue! It has a 50's feel, doesn't it? Not a shape I wear often (it's the only shirt-dress I own.) And it's not my best shape, but It's still a great dress. There's no one any nicer than you, kid. Your blog always makes me happy to see, and I'm always happy when you stop by here. Big cyber hugs, and my most sincere appreciation for all you do. Wow! It is difficult to list folks, isn't it. One of my big projects coming up (big for my skills, anyway) is just to get my list of favorite blogs updated. It's intimidating, because I have a very long list of favorites, and I usually just give up before I start! Thank you for your always kind remarks and support. I always will remember seeing your blog for the first time. You were sitting out doors at a little garden table wearing all pale gray (or was it white) and I thought you were the most beautiful woman! Still do, and I've learned what a skilled lady with such a creative spirit you are. You are always welcome here, whenever you can stop by. Thank you, Ann. For your sweet remarks, and for your aspirational blog as well. You have such a specific personal style, and such a high level of taste that I'm always inspired by your approach to dressing. Your work with your husband is an additional new pleasure in my life and I'm so happy to have seen your work ...will watch you and your art with enthusiasm! Hey, Val! What nice things to say. High praise indeed, and although I can't live up to it, I can try. That's what we all do, yes? I'm so happy to have met you this year, and I'm always impressed with the artistic approach you apply to your whole life. That's what I think of as star power! Thanks so much, and please always drop by when you're so inclined! Nice of you to say, Lisa. I've really enjoyed watching you evolve this year as well. Talk about blooming in public ... yeaaaay, you! The dress is from the Duro Olowu collaboration with JCP from last spring. It's pretty dramatic for a shirt-dress, and I'll wear it evenings at the restaurant this winter. Or out to dinner, like I did last weekend ... too heavy to wear without some serious AC right now, though! Thank you for liking it! You are always so kind, and I'm always thrilled to see you when you drop by. London? From your mouth to the ears of whatever gods claim me! Thank you so much for the very nice comments, V. Your blog has been a joy for me since the first time I read it. I figured if "taxonomy" was applied to "wardrobe" at this blog, I was in for a treat. And so I have been. We live in such different worlds, and it is always a pleasure when you show us how you live in yours. Especially what you are wearing while you live it! I hope you will always feel welcome here, whenever you have the urge to stop by. Hey, Mel! That's high praise from one of my favorite women and artists and style icons! Thank you so much. One of the high points of my week is when I check in to see what you're up to. There are so many ways to make art, and it's encouraging to see your work evolve and flourish. You are always welcome here, little white cat. People don't get any finer or more completely amazing than you, our Curtise. Keeping up with you and your crew is one of my favorite activities. Your taste is admirable, completely your own, and I always love to see what you are thinking about what you are wearing. That's what makes a blog interesting for me, and you never disappoint. Praise from you is always of high value, and you are one clever woman! Smart is really important. So glad you like the dress ... I can easily see you wearing it. It's not a shape I wear often, and this dress took some alterations, but the fabric was too beautiful to leave on the rack. We still hope to travel, some day. You're right ... who knows? Good things can happen as easily as bad ones. They usually just don't get as much attention! I hope you know I'm always thrilled when you stop by. Congratulations to you, as well. I'm sad that I missed your post about it! I will go look for it as soon as I can. You've had quite a year, and we are all thrilled at your progress ... you have such a fun personal style that I always look forward to seeing what you're thinking about! Thanks always, for your kind comments. I always appreciate a visit from you. Thank you so much, Judith. Visiting your blog is one of the best things I do for myself all week. You are a bona fide style icon, not for just for your amazing flair and fashion savvy, but for what you think and feel about your life as an ongoing project! Whenever you have nice things to say about my blog, I pay attention and am always thrilled. I'm over the moon that you like my dress, and these flashy shoes. They are more special to me now because of your comment. Please drop in whenever you have the time and inclination! So glad to hear from you, always Suzanne. Have to tell you that we STILL say "keep on truckin' " ... it's an old person thing! Gotta watch my colloquialisms. They can age you fast! I appreciate it that you are entertained ... it's a primary goal for me. The best style bloggers, you among them, always offer something for the reader beyond just a look at an outfit or two. Thank you for appreciating what I try to do. I'm so happy to see you healing from your recent adventures with modern medicine. My hope is that things get much better, very quickly for you, darling girl. Hope you know you are always welcome here, and I look forward to your posts. Thanks Laurie! I really appreciate your nice words. Patti is the best, isn't she? Can't say enough about the opportunity to connect with the wide world through these get-togethers! Thank you for stopping by .. always a pleasure. Sacramento! Your blog is one of the best things that's happened in my life this year! You always give us something wonderful to see, and to think about as well. That's the best thing in the bloggy-world. Have a wonderful week and drop by anytime you can. Cyber hugs to you, and I'm looking forward to your next post! Thank you so much, Emalina. I'm happy you liked my choice for the end of the first year. It is pretty glam, isn't it? I hope you will continue to find something interesting to see at my place this next year. I always do at yours! I'm so happy that you dropped by. Hello, Anja! So nice of you to stop by. I've enjoyed this year so much because of people like you. You have such a lovely, highly personalized approach to what you wear. Your own blog is always inspiring. Thanks for reading my blog, and know that I'm always pleased to hear from you. Doesn't it just! Smaller, and much more fun. You've been a pleasure to follow this year, and will be in the future, I know! Thanks so much for reading and dropping by, Tamera. I appreciate it so much. I don't think so! I only post once a week, on Mondays or Tuesdays at Visible Monday. Patti's parties keep me on a schedule, and the first part of the week is my "weekend" when I have time to post. Since she's going every other week, I'll keep up on my own, I hope. Thanks for asking ... nice to know you're looking! So nice of you, Olga. No one dresses up for special occasions like you do. Once again, I'm always so pleased to read your "local" style blogs ... fascinating, and you write well about it always. Please feel free to stop by, anytime! Thank you for everything. Darling SS! Thanks so much ... nice words like that and coming from you, especially, are a real treat! I get such a kick out of your posts, and think of you with a mug of your morning favorite in your hand. I'm so happy that you have your new pup all settled in ... looking forward to hearing about her and your shopping and style adventures. So happy you dropped by to help me celebrate. Happy Blogiversary Jan! I'm glad you start blogging and I appreciate your special view of fashion and style, your posts with a wink in the eye, your outfits so versatile and inspiring and your comments coming from heart. You look marvellous and shining and absolutely visible! Congrats on your Blogiversary! As a newcomer to this world of blogs, I have so appreciated your visits to my little blog, your kind words, and your encouragement. And I anxiously await your posts to your own blog because I love your writing style, your incredible sense of humor, and your take on all things of style. Oh, and you look fabulous in that beautiful dress! Happy happy blogiversary!!!!!! Wish you more years of successful and fun blogging! This dress is so you, you look beautiful! Happy Blogaversary!! I love to read you here, there and everywhere...sometimes your comments on other blogs are the most insightful thing I'll read all day. Keep it up sparkles, you are amazing. Hey, Sabine! So good to hear from you, as always. Thanks so much for your very kind comments, and please know that your own blog is on my don't-miss list. Your thoughtfulness is evident in how astutely you consider your combinations and in your kindness and enthusiasm for others. I really wanted to be visible on this anniversary ... glad you think I made it! You are welcome here, always! Dana Jo ... so happy you stopped by! Your English is great, surely good enough to say hello (so much better than my non-existant German)! Thank you for your very sweet words. You are the best, and write a great blog! Pet your kitty for me! Hi, Norma! Thank you for stopping by to celebrate a little with me. I'm enjoying your blog posts as well ... we have a lot in common, especially now that I got my enforced haircut! You'll find me every Monday or Tuesday, once a week. I tried more, but I don't have that much to show off or talk about. Nice of you to like my dress ... it's really meant for a special occasion, don't you think? Thanks for all, and I hope to see you soon. Hello, dear Alyssa. Thank you ... you always say such nice things. I can return the compliment about comments. I always read the interesting and generous and sweet ideas around the comment sections, and am always impressed with the thoughtfulness of your own blog. You're a talent, kiddo! And of course, you're always welcome here. This wonderful glittering dress really goes with the oportunity, you are very beautiful. Thank you, GeeGee! Fashion diplomacy, of course! No better way to draw women together, is there? I appreciate your very nice comments, and am so glad you came by for a visit. You are always welcome here! Thank you, Sharon, so much. It's been fun, especially meeting great women like you! I always look forward to hearing from you. Hope you have a good weekend as well. If the restaurant is busy and I get to see the Phillip Lim collaboration first-day on Sunday, I'll be happy! Great dress, so lovely. Happy anniversary. My first one is in November this year. I really like your sense of humour. (And your new hair style). Tomorrow (Monday at 18.00 hours Dutch time) I am posting an invitation to my readers to come to Amsterdam and meet up. Why don't your join? I would be happy to see you. Only a year?! And look at all the friends you've made in the blogosphere!!! You are one incredible lady who has such inspiring posts and uplifting words that are always a pleasure to read. Congrats on your 1 year and count us as loyal fans!! Thank you, darling Greetje. So nice of you! I'd love to join you guys ... whom ever it winds up including ... but we don't have a travel budget this year. I'll have to be content to enjoy from a distance, and watch the fun from my living room "command-post"! I appreciate the invitation, though. I'll be watching your site for your November celebration ... I assumed you were a more experienced blogger ... great job! Thanks so much, ladies! Such nice things to say! PopCosmo has become a favorite site, and I don't get over as much as I'd like. Trying to correct that in the coming year! I appreciate your constant willingness to help the blogging community, and especially me!. Have a great week, both of you. Happy one year of blogging to you! I really is a fun world--getting to write and learn from others' writings, too! It really is fun to find readers from different countries all over the world, I'm always amazed by the variety of people I meet! And that is a lovely dress! Ah! Thank you Rachel. It is a big, bloggy world ... and how fun is it to look at what everyone else is wearing? So much! I appreciate your visit, and you are quite welcome anytime! A very late happy anniversary Jan! Although I have not had time to read or comment on blogs (or blogg) lately, your blog is one of my favorite blogs! Always thoughtfully written and stylish outfits! That dress is divine!